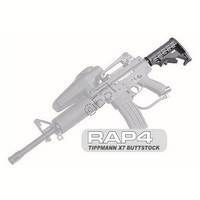 LAPCO has recently released a PDW style fixed stock that is compatible with the Tippmann X7. 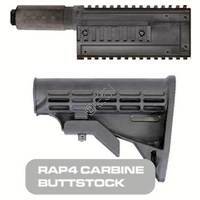 This stock is made of a high grade polymer for those who want an authentic mil-sim looking stock for their X7. Lightweight composite construction. Collapsible to five positions. Includes composite car stock, and flatline barrel. Extending/Collapsible – These stocks will be adjustable in length, making it easy for you to choose the most comfortable position between you and your marker. Fixed – These stocks only have one position and do not move. These stocks are generally more lightweight than their counterparts. Foldable – These stocks will have their set out position, and will also fold to the side of the gun. This is ideal for people who engage in long range play, as well as tight spots where a stock would not be ideal. Carbine – Car stocks will commonly be collapsible and will look like AR-15 stocks. Skeleton – Skeleton or wire stocks are designed for those who want very little size and weight to their stock. Specialty – Want to make your marker look more realistic? 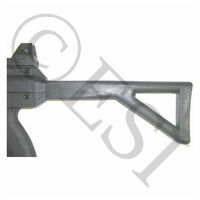 We have MP5, G36, AK-47, and AR-M4 designed stocks. Tactical – These stocks are designed to give your marker a tactical feel to them. Most of these are somewhere between carbine, and skeleton stocks. What are Paintball Shoulder Stocks Made of? Metal – Metal stocks are going to be the most durable. They will be nearly impossible to damage; they will however generally be more expensive and weigh more than other materials. Plastic – These stocks will be lightweight and will not cost you an arm and a leg. Although they will not be nearly as durable as metal or composite stocks. Composite – Composite stocks are made of composite plastics. These stocks will be between the aforementioned materials in nearly all qualities. They are typically more durable than normal plastic, but less durable than metal. Also the cost will mainly be in between the metal and plastic stocks. Rear Velocity Adjustment (RVA) – RVA stocks will give you a second option for changing your markers velocity. While the original allen wrench adjustment in the left side of your marker will still adjust the internal air pressure, an RVA stock allows you to change your spring tension as well. This makes little tweaks to your FPS (feet per second) easier than ever. Replica Military Parts – Stocks that are designed with replica military parts give you the ultimate realistic feel to your paintball marker. They are designed around their real military counterparts.